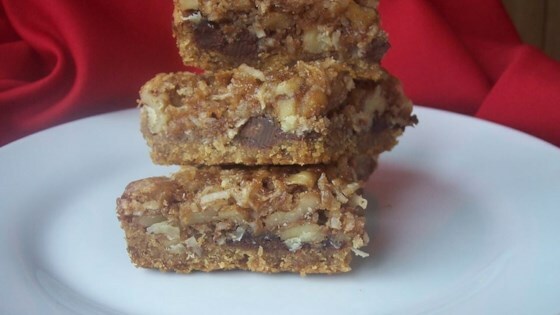 "These are chewy moist coconut bars. This was a special treat during the 1930s and 40s which my mother served often to our farming community by popular demand." Preheat the oven to 325 degrees F (165 degrees C). Grease a 9x13 inch baking pan. In a medium bowl, mix together the shortening and 1/2 cup of brown sugar until smooth. Stir in 1 cup of flour and salt until well blended. Press into the prepared pan. Bake the crust for 15 minutes in the preheated oven, or until delicately browned. After removing the crust from the oven, increase the heat to 350 degrees F (175 degrees C). Make the filling while the crust is baking. In a medium bowl, stir together 1 cup brown sugar, baking powder, and 2 tablespoons of flour until well blended. Mix in eggs and vanilla, beating until thick and foamy. Stir in the coconut and chopped nuts. Spread over the warm crust. Bake for 25 minutes in the preheated oven, or until bars are lightly browned and puffy. Cool completely, and cut into small bars. I find these overly sweet and soft. The best part of them for me was the walnuts. I will not make them again. Turned out great. My hubby doesn't like nuts so I substituted dark chocolate chips for the nuts. This recipe similar to the recipe my mother made and was a personal favorite. We called them chews. The main difference was her recipe did not have salt or walnuts. These cookie bars brought back such great memories. As a child in the 60's we went to Nanny's house in Halifax and these were the buffet drawer favorite. Captured the memory exactly! Thank you!